With an authentic product like Old Angler’s vegetable tanned leather, ethics plays a large role in the manufacturing of goods. All of our employees are expert craftsman with extensive experience in the leather industry and registered members of the Florence Camera di Commercio. We seek to set an example for all manufactures by taking a stance against child labour and under the table work, and closely following the ethics standard SA8000 to eventually receive the Quality Certificate in the near future. Conserving and protecting the environment is a must for everyone, most of all manufacturers. For this reason, we have chosen to limit, as much as possible, the use of synthetic materials in each of our products. All items are made with vegetable tanned leather, lined with 100% cotton fabric or leather, and equipped with metal fittings. The materials that make up our products are either recyclable and bio-degradable or have a low environmental impact. No animal is killed for the sole purpose of leather making, all rawhides are recycled by-products from the meat industry that are otherwise discarded as waste. From the fruits of extensive research come the best ideas. We work closely with our most important collaborators, our clients, to create new product collections and models based on their input. We also value the close relationship we have with our suppliers who contribute to product development with new materials and accessories. No company would exist without its clients, so it is with much attention that we seek to cultivate and maintain relationships with all our customers. 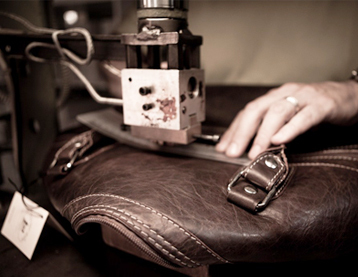 And because a satisfied customer is a source of pride for us, as well as a valuable asset and advertiser, all of our leather products come with a 2 year quality guarantee, during which time any and all product malfunctions will be repaired free of charge (does not include damage to product due to inappropriate use or treatment). We are in complete compliance with ISO 9001 quality regulations, having received the Quality Certificate in 1998, and continue to develop and improve our own quality standards based on the needs of the market and our customers.